A tooth's nerve which has gone bad can be extremely painful. In plain English, root canal treatment is removing the pain while keeping the tooth. The dentist removes the bad nerve from the inside of a tooth, starting with lots of Novocaine, so the patient is comfortable during the procedure. This relies the pain, yet keeps the tooth. The other option to relieve the pain of a nerve gone bad is to remove the tooth. It's almost always better to keep your own tooth. Root canal treatment ("Endodontics") involves cleaning the hollow center of a tooth, called the "pulp chamber" and the "pulp canal". Collectively, the pulp of a tooth refers to nerve tissue, small blood vessels, connective tissue and lymph. When the pulp becomes inflamed, it can be very painful, and often result in mild, moderate or even life threatening swelling. This is serious stuff, not to be trifled with. 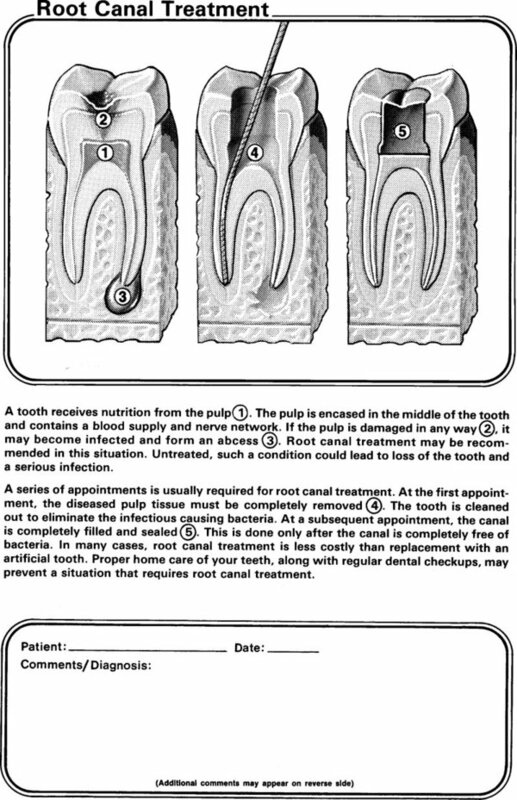 Sometimes your dentist will recommend a root canal even though you are not having any symptoms. Often the patient has had symptoms weeks, months or years ago, and those symptoms were masked with a fist full of Advil. The pain reliever masked the symptoms, but did not treat the cause of the pain. Sometimes the pulp of the tooth will die slowly, and create a low grade chronic infection inside your jaw bone. This infection will show on routine xrays. Your body's immune system might be able to keep a low grade chronic infection under control, for a while. How long? Who knows? Best to take your dentist's advice (isn't that why you go to your trained dental professional?) and have this infection treated before it becomes severe. Or you can wait until it hurts. Your call! An inflamed nerve can be very difficult to treat to begin with, and more so if the unfortunate patient is a mental wreck. Teeth can be saved with proper root canal therapy, without all the histrionics associated with Hollywood, comedy clubs routines, or anything other horror stories you may have heard. Often, the infection needs to be first brought under control with antibiotics before treatment can begin. In our office, if the patient has any discomfort during the procedure, more anesthetic is administered. We stop and put in more Novocaine. There are some roots that are too curved, or the nerve is just too inflamed to be treated by a general dentist. That's why root canal specialists were invented. Our specialists always take good care of our patients, or they are removed from our referral list!